While most college students are at home during winter break, many Virginia Wesleyan students are on campus or studying away as part of Winter Session, the University's three-week credit-bearing term held each January. To celebrate the activities of the January term, Winter Session 2019 includes a new event. Each Thursday, members of the campus community gather in the atrium of the Greer Environmental Sciences Center during the lunch hour to showcase Winter Session happenings. “Cheers in Greer” Thursdays invite students, faculty and staff to gather and share experiences over a cup of hot chocolate. Images of students and faculty actively engaged in Winter Session activities rotate on a large screen and much animated conversation about their adventures ensues—all indications that there is much to cheer about this Winter Session. 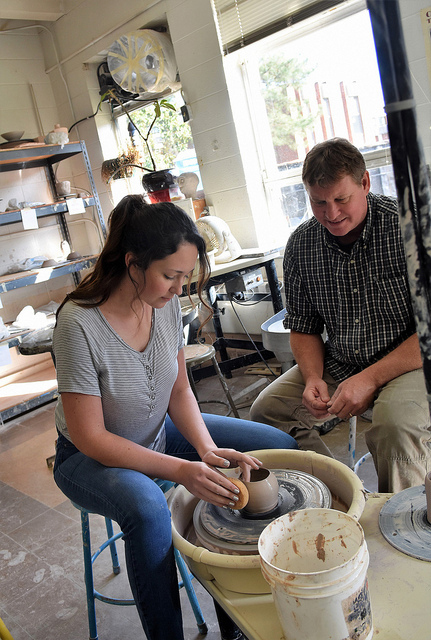 Freshmen Ashlee Bobzin, Sarah Conley and Michael McCartney are all enrolled in Professor Phil Guilfoyle’s “Intro to Studio Art” course this month where they have the chance to explore clay, sculpture and more and experience the area’s art venues like the Chrysler Museum. Sixty-one courses, including online classes, are being offered this Winter Session. Some of the most popular, with enrollments greater than 30 students, are "Science of Zombies," "Why Harry Potter?," and "Service Learning & Civic Engagement." “I think these courses are popular with students because they are either engaging students in the community or center around characters and themes that have cultural significance and popularity,” notes Gonsalves-Jackson. In addition to courses on campus, students are also earning credits around the globe through study away travel courses. VWU Batten Fellows are participating in the Batten Fellows Leadership Institute, attending the Continuity and Change in American Leadership program offered by the Osgood Center for International Studies in Washington, D.C. 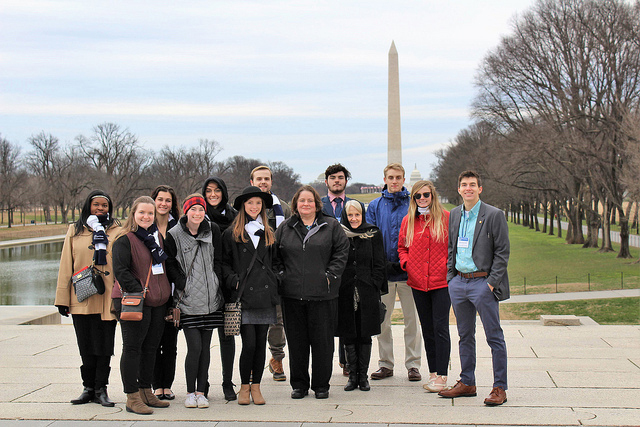 This special program provides a unique opportunity for students to learn from informed speakers about the American political process, attend significant Washington events and ceremonies, and visit diverse agencies and locations. A Batten Honors College Trip to Mexico was designed to combine perspectives based on the sciences and the humanities, as students travel to the Mexican cities of Valladolid, Chichen-Itza, Tulúm, Mérida, Dzibilchaltum, and more. Students are exploring the Mayan civilization in a region where human activity has been active since ancient times and have the opportunity to contrast the ways in which different societies transform and adapt to the natural world. During a Seminar in the History of European Cities, students are investigating the history of Prague, focusing on art, architecture, city planning, and public spaces. Through walking tours, visits to museums and key landmarks, and musical performances, they are investigating historical developments, especially the conflicts radiating from the construction and destruction of the urban landscape (read student travel blogs). Travel’s Impact on Culture and the Environment has students examining the impact of adventure travel on culture and the environment in Maui and throughout Hampton Roads. Winter Session provides a unique opportunity for students, including first-years, to engage intensely in interesting areas of study both in and outside of the classroom. Learn more about Winter Session at VWU.